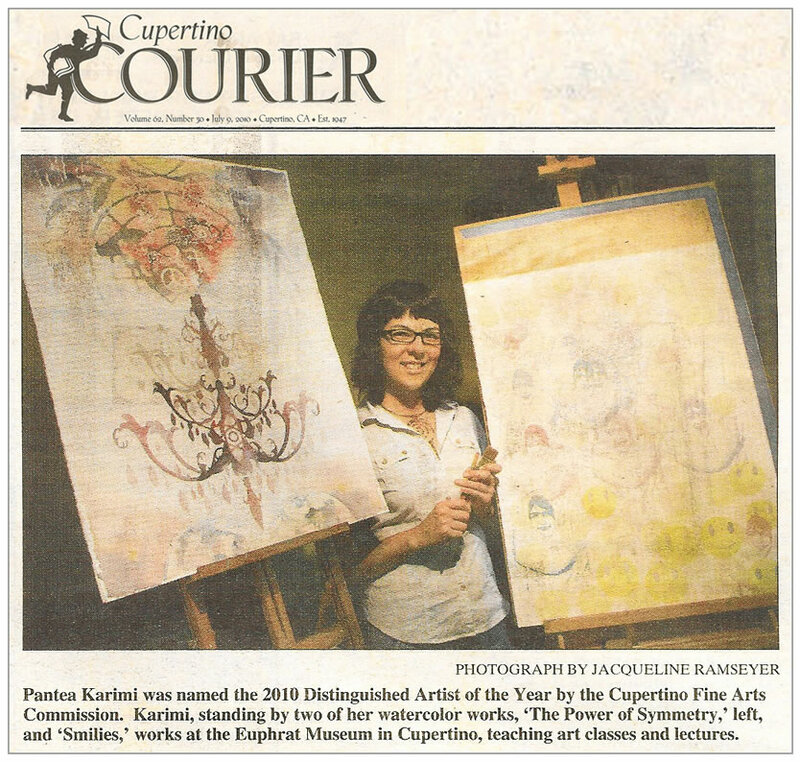 Artist Pantea Karimi created one of the exhibit’s most arresting pieces, offset in the gallery space by two small walls. Featuring digital archival prints of flowers arranged in circular fashion around a centerpiece, Karimi composed the piece as a reflection of the herbal medicine tradition in her hometown of Shiraz, Iran, as well as of her work researching medieval and scientific manuscripts. In this enclosed space, the piece takes up a sizable portion of the wall — yet another refraction of how the self-portrait can go beyond a physical representation and assume a more conceptual form. “Self-Portraits in the Age of Selfies” is a comprehensive view of what self-portraiture can be, with a wide variety of pieces and perspectives on how we look at ourselves. Rather than indulgent or narcissistic, as selfies are so often seen, this exhibit is a celebration of self-interpretation and the many forms in which one’s self can be viewed. Screen-printing in its essence is a marriage of technology (machines and equipment) and tradition (developing imagery through multiple graphic techniques and printing on paper), which makes the medium versatile and suitable for both crisp images and painterly effects. In recent years screen-printers also have used digital applications, which help add further complexities and possibilities to the production process. I am a screen-printer with an interest in using the screen-printing process as a base for creating both multi-media and mixed-media artworks. As an artist, I find the screen-printing medium has inherent qualities that motivate me and stimulate a particular creative thought-process. In 2014, I began a new research project which revisits my earlier investigations in the history of Iranian print media. My work since 2014 has been an exploration into the pages of medieval and early modern scientific manuscripts, particularly Persian, Arab and European. I am intrigued by the complex expressions of medieval and early modern scientists through scientific illustrations and diagrams. This research project further compelled me to utilize different materials, experiment with novel ways of displaying my work and employ new technologies. I have been using art installations, screen-prints on paper and other substrates, Virtual Reality and video projections to create a dynamic visual interpretation of the scientific concepts and ideas presented in the manuscripts. My research into the visual representations of medieval and early modern mathematics, medicinal botany, anatomy, optics and cartography is ongoing. Printmaking rarely aspires to monumentality. Its history, with a few notable exceptions, is largely one of intimate works made either by dedicated printmakers or by painters seeking to expand their purview with help from master printers. 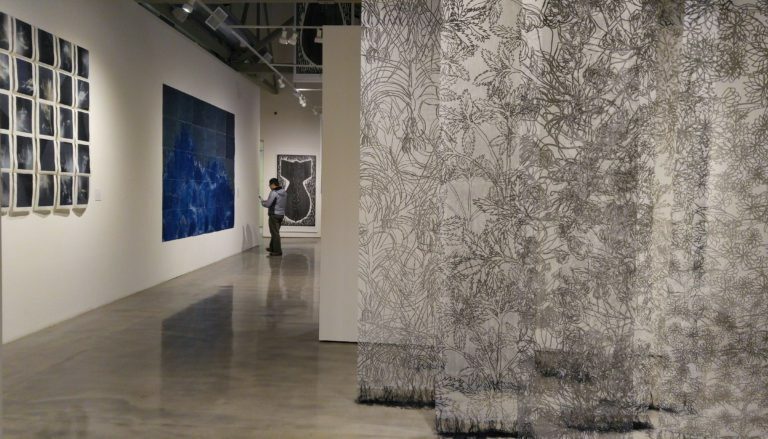 Printstallations, a show featuring the work of eight such masters, upends that tradition by filling half the San Jose ICA with large-scale prints. They dominate entire walls, hang from the ceiling and activate floor space using a wide range of media and techniques, including photography, lithography, textiles, woodblock prints, computer-aided design, LED lights and much else. The exhibition is but the latest example of the ICA sidestepping staid white-cube displays in favor of more active modes of audience engagement. While size is a critical component, the strength of the show rests more with innovative processes than with expositions of sheer scale. 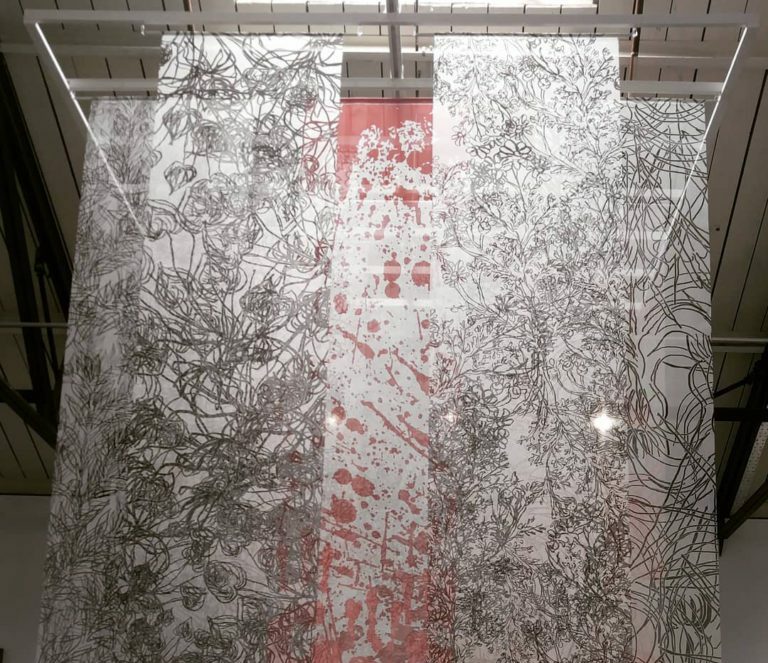 Pantea Karimi, a native of Iran, imprints floral patterns culled from a 12th century herbal medicine text onto translucent silk banners that hang from the ceiling. Her efforts, titled Folding Gardens, bring to mind those of another 19th century German photographer, Karl Blossfeldt. His precise shots of plants, achieved with a camera capable of magnifying subjects by up to 30 times their original size, revealed structural patterns never before seen. In this space, Karimi has the sound of a water fountain emanating from speakers. 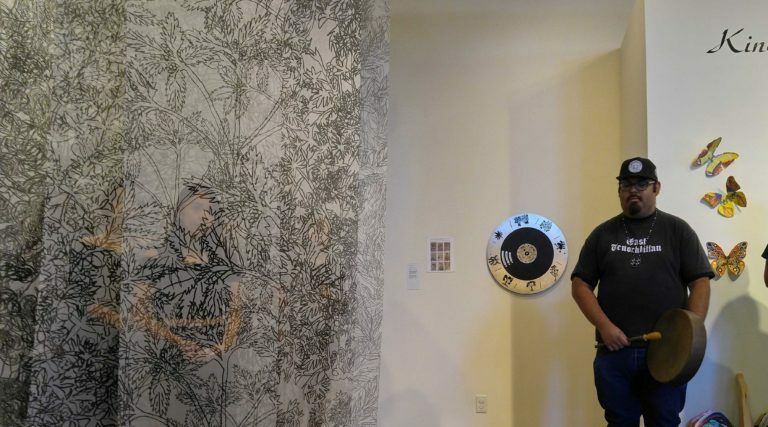 Alongside “Folding Gardens” is another piece that’s titled “Medicinal Herbal Volvelle,” an interactive wheel installation that reveals the healing properties of eight plants. And right next to that is a shelf that contains plant extracts—another interactive piece that invites visitors to open the bottles and take a whiff, a Shiraz-inspired piece of art, Karimi said. These are tumultuous times and there is an endless barrage of disturbing images that remind us how much misery and pain is in the world. One such haunting image surfaced in late 2015, when the world became aware of the photograph of a three year old Syrian boy Alan Kurdi. He wore a bright red T-shirt and he was face-down on the beach, like a discarded toy. He drowned in the Mediterranean Sea as his family fled crisis in the Middle East. That toddler could have been anyone’s son. But instead he became a symbol of something gone very wrong. In an alcove, Pantea Karimi (sister of the curator) displays “Waters of Life, Waters of Death” in which a video projection of lapping waves on a tranquil beach is projected over black silhouettes derived from ancient maps of the Persian Gulf, the Caspian Sea and elsewhere. The sound that accompanies the video is soothing. But it would be a tragic mistake to get lulled. Art: We’re the Center of the Universe! 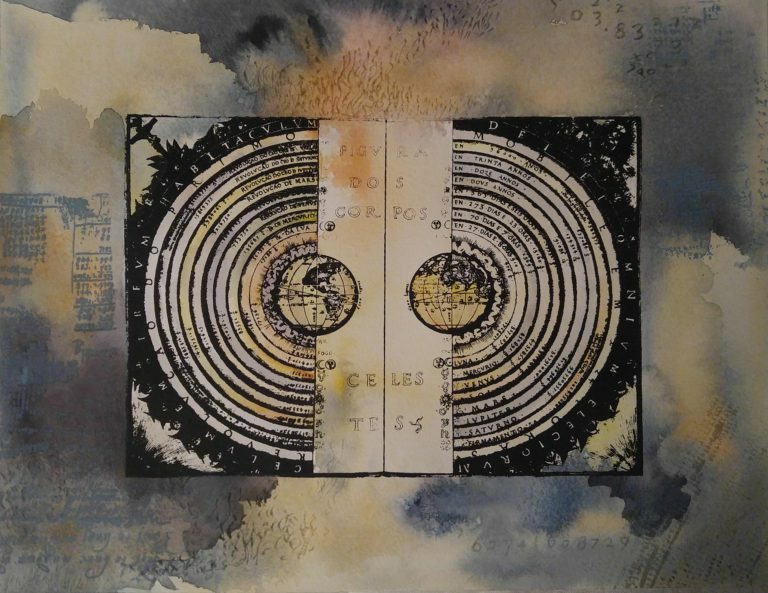 In Pantea Karimi’s new watercolor and silkscreen work called The Return of Geocentrism i, centuries of knowledge — and layers of meaning — flood across a celestial horizon that has the sun revolving around the earth. The art is Karimi’s take on a 16th-century cartographic work by Portugal’s Bartolomeu Velho, who was envisioning a second-century idea by the Greek-Egyptian scholar Ptolemy. In Velho’s time, during the European Renaissance, knowledge was transferred through books translated over the centuries by Arab and Persian scholars who’d kept alive Greek theories that would otherwise have been lost. No Arab and Persian scientists. No European Renaissance. Karimi is honoring this cross-century transference, where Velho was collaborating with Ptolemy through ancient scholars from the Middle East. 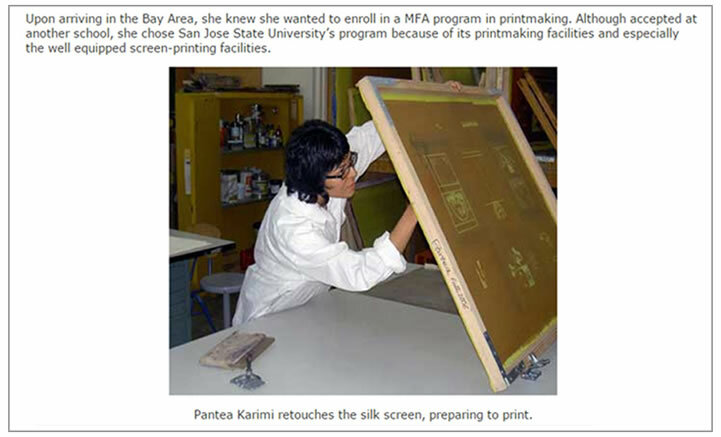 But Karimi’s work, which is part of her art series called “Punctum Caecum” — Latin for “blind spot” — is also a sly commentary on today’s environmental concerns.”I use the title ironically,” says Karimi, who was born and raised in Iran and now lives in San Jose. “Because of all the problems that we have on Earth — climate-wise and scientifically — the return of geocentrism is a kind of metaphor. Do we have to pay attention to Earth again? Isn’t it Earth at the center of attention?” Karimi will exhibit The Return of Geocentrism i and other work from her “Punctum Caecum” series at stARTup Art Fair San Francisco, which runs April 29 through May 1 in the Marina District and features many artists who don’t have traditional gallery representation. How would you normally describe the body of work that you produce? What kind of artist are you? 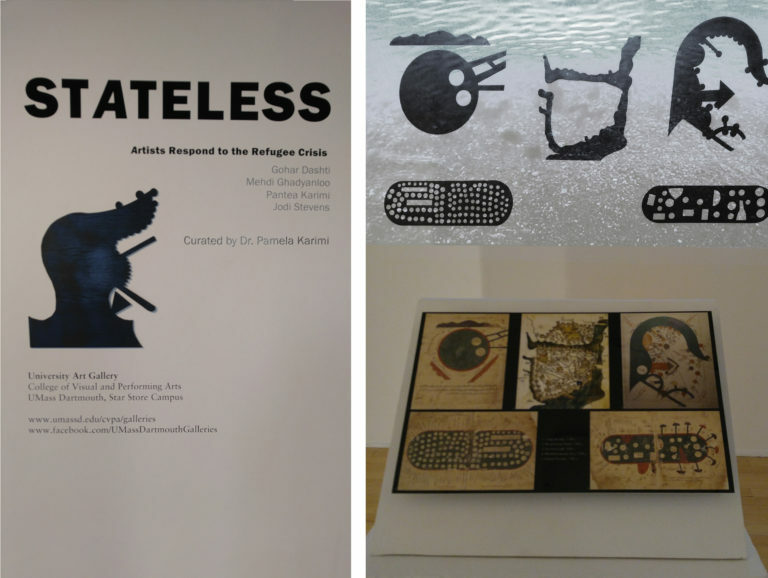 Pantea Karimi: I have had a long-term interest in juxtaposed textual and pictorial elements. I am intrigued by the ways in which image and text interact and convey meaning. 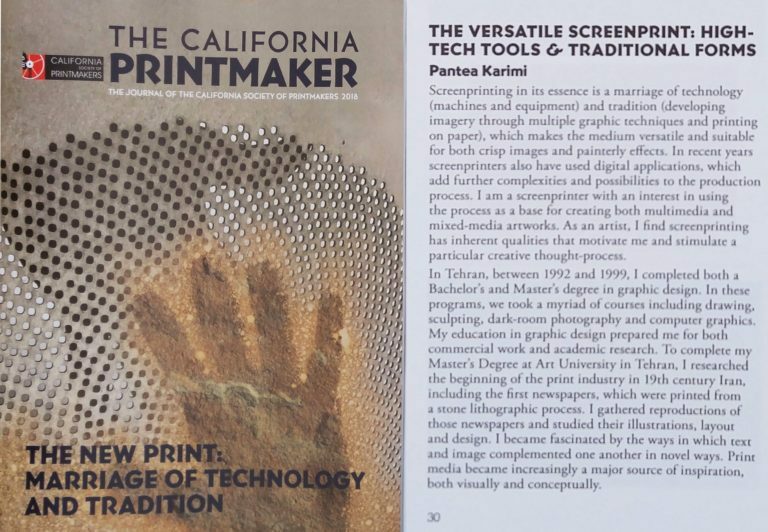 Following this interest, my current body of work explores the history of archaic technologies and investigates how older scientific knowledge was communicated through both image and text. I examine medieval and early modern scientific manuscripts–Persian, Arab and European–and the longue durée (long term) exchange of knowledge across these cultures. This process not only provides me with a great means to explore what I love–the relationship between image and text–but also expands my appreciation of science and its role in the visualization of abstract concepts. The scientific manuscripts are dynamic and engaging. Most of them are filled with beautiful drawings and calligraphic texts. Others include interactive devices, such as volvelles (paper wheel charts) that accommodated calculation in many diverse subjects and used beautiful images, calligraphic texts and numbers. I am a printmaker and painter and I also hold a professional degree with work experience in graphic design, all of which have influenced my fine art aesthetic and practice. For the past few years, I have been using mixed-media techniques in my works, mainly a mix of silkscreen and monotype printing with watercolor and graphite on various substrates. 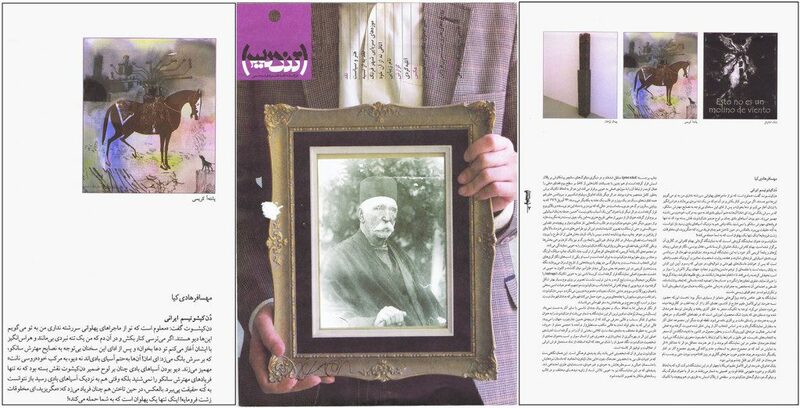 Additionally as a graphic designer, I have always been intrigued by the design and layout of books and print media; my graphic design capstone project in 1999 was an exploration into the design and layout of nineteenth-century Iranian newspapers. Which artists and art movements have been important inspirations in your own artistic development? How have you developed your own creative voice? PK: While medieval and early modern scientific manuscripts are my main sources of inspiration, I am also influenced by the work of modern avant-garde artists. In terms of abstraction and arrangement of my own forms, I draw inspiration from the Russian Suprematist artists El Lissitzky (1890-1941) and Kazimir Malevich (1878-1935). These artists were in search of a style of abstract painting based on geometric shapes, which they believed promoted the supremacy of pure artistic feeling over the depiction of objects. Being influenced by Suprematists, I began the Punctum Caecum series by selecting medieval and early modern Persian, Arab and European scientists who were inspired or influenced by each other’s scholarly works or theories. I then rendered the pages of texts and diagrams of the manuscripts by these scientists into black shapes. These black shapes provide me with a new visual form of engagement with scientific content and offer more compositional opportunities in my works. Like Suprematists’ works, these black shapes aim to engage the “pure feelings” of my audiences through simplicity and absence of didactic information. I want to explore the ways in which viewers respond to form both visually and conceptually. I believe that creativity is innate, and it must emerge naturally. Similar to the Suprematists, I want to instill a “pure” process of thinking into my audiences. 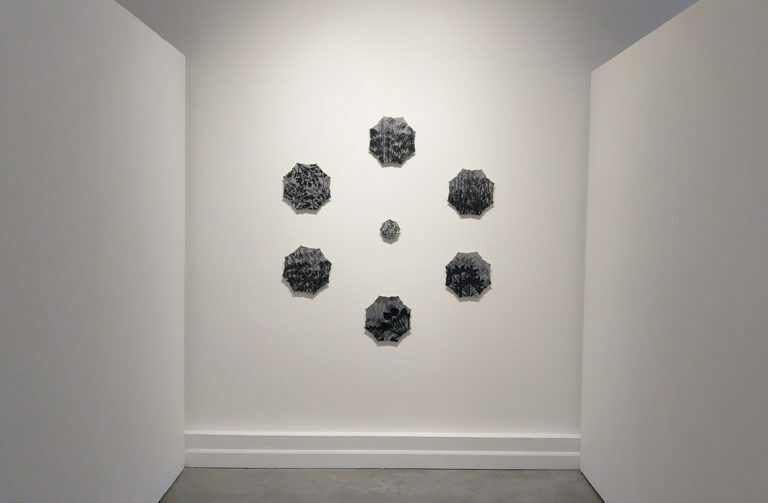 In this particular project, I have developed and enriched my creative voice through observation and exploration of form and scientific content and the ways I interpret these pieces of information in my work. How is Punctum Caecum different from your earlier projects? PK: My series Punctum Caecum, which means “blind spot” in Latin, is the result of my exploration of ancient Arab, Persian and European scientific manuscripts. “Blind spot” stands for both the Dark Ages and for when we turn a blind eye to the fluidity of exchange of knowledge between these various scientists. The scientific books from the medieval Islamicate world and early modern times offer nuanced understandings of the relationship between form and text, and above all, between scientific concepts and their myriad manifestations in visual forms. Medieval and early modern scientific manuscripts were composed of hand-drawn images and diagrams, as well as textual and mathematical explanations. Each page of these manuscripts often separated images and texts through both structural compositions and random layouts as they appear to our eyes. To reiterate, sometimes commentators penned their thoughts as marginalia, thereby initiating a dialogue with the reader. All the above attributions make this project not only different from my previous ones but also very special and fascinating for me to work with. Moreover by revisiting the scientific concepts through the lens of art, I highlight the significance of visual elements in science. In fact, I see similarities between scientific and artistic discovery processes; both fields share exploration–visually and conceptually–use imagination and communicate meaning. This new project and research have elevated my inner awareness about the ways in which we communicate as humans and the many forms that this communication takes. What were some of the driving forces behind Punctum Caecum? To research Math and Art I had to learn maths concepts like calculus, group theory and predicate logic. As a novice struggling to understand these ideas, I was struck with the poor quality and confusing content of illustrations in most educational books. So I vowed to create for my book a set of cogent math diagrams that are crystal-clear visualizations of the abstract concepts. As a lecturer at the School of Visual Arts in Manhattan, I wrote this book for my students, such as Maria, who told me she was never good at history because she couldn’t remember dates, and for Jin Sug, who failed high school algebra because he couldn’t memorize formulae. I hope they will read this book and discover that history is a storybook and that math is about captivating idea. In Iran, high school students are required to choose a major and stay with it for the entire duration of their education. By the age of 15, I had invested most of my free time in fine arts studio practice and had received music lessons on a regular basis. Despite all this, my parents wanted me to enter my high school’s natural sciences department, which prepared students for medical school. My parents were great advocates of art; however as pragmatists in a society that mainly praises doctors and engineers, they encouraged me to become a pharmacist. But their wish never came true. As years went by, I faced many difficulties and ended up switching fields of study on entering college. This was mainly due to the fact that the scientific concepts were not explained extensively or in a hands-on way, and rote learning was the main focus at the time. My biology and chemistry textbooks included images (albeit in poor black-and-white quality), and in hindsight, I recognize how those difficult and abstract scientific subjects spoke to me more vividly through images and diagrams. This relationship between visual representations and abstract ideas has continued to captivate me and has become the basis for my current research and work. As an artist, I am naturally driven by my deep feelings and childhood experiences that have shaped my perceptions of the world. So, my unsuccessful encounters with scientific subjects have always endured, and I am still in search of a way to overcome this shortcoming. Consequently, Punctum Caecum is somehow a personal journey. Your Volvelles are fascinating, which remind one of astrolabes. 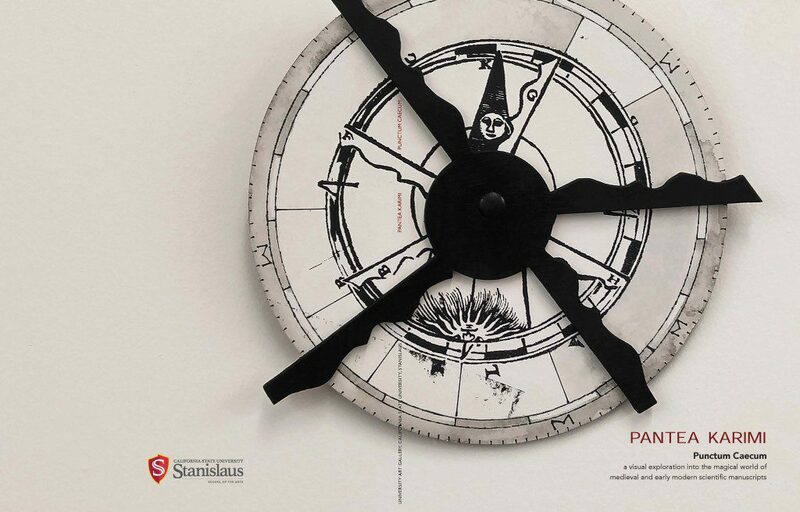 Astrolabes metaphorically inscribe the world, making the globe a particular text itself. Are you drawing attention to similar constructions of historical knowledge and intentional mapping of the world, perhaps as they pertain to contemporary issues? It is the volvelle’s artificial memory within the context of manuscripts that makes it all the more different. As an artist, my hope is to remind the viewer of the often forgotten glorious memories of the exchanges of knowledge between the European, Arab and Persiante worlds. In making my volvelles’ imageries, I stack multiple layers of scientific images and textual content. In some, I mix and match Persian, Arab and European medieval and early modern scientific images and information, and by doing this, I aim to construct historical knowledge of various cultural points of view into one form. For example, in one of my volvelles I layered Galileo’s manuscript page on the observations of the moon with the eleventh-century Persian astronomer Biruni’s observation of the moon’s diagram. What do you want viewers to take away after seeing Punctum Caecum? How do you expect viewers to relate to medieval and early modern depictions of knowledge in a contemporary context? PK: All the pieces in Punctum Caecum collectively highlight a long-term flow of scientific knowledge and exchange of ideas across cultures. This series aims to initiate a dialogue with the viewer, communicating how knowledge transcends social, political, and cultural boundaries. By highlighting the medieval and early modern manuscripts’ visuals and other contents, I also aim to draw attention to these rich forms and to invite the viewer to observe science and its history through the process of image-making. What is your next project, or in which direction is your work headed? PK: I will continue to expand the Punctum Caecum series. Among the projects that I would like to pursue is exploring medieval and early modern manuscripts of botany from the European, Arab and Persiante worlds. A second project involves making ideograms that represent all scientists who made a significant contribution. What is your advice to artists who are just starting out? PK: Commit to your art and always stay true to yourself and to your work. Lynn Gamwell “Why the history of maths is also the history of art” The Guardian, December 02, 2015. Available at http://www.theguardian.com/science/alexs-adventures-in-numberland/2015/dec/02/why-the-history-of-maths-is-also-the-history-of-art (accessed December 10, 2015). 2Rheagan Martin, “Decoding the Medieval Volvelle,” Iris: The Online Magazine of the Getty, July 23, 2015. Available at http://blogs.getty.edu/iris/decoding-the-medieval-volvelle/ (accessed August 26, 2015). Karimi said she hopes her artwork can educate museum patrons on not only the language but also the culture.